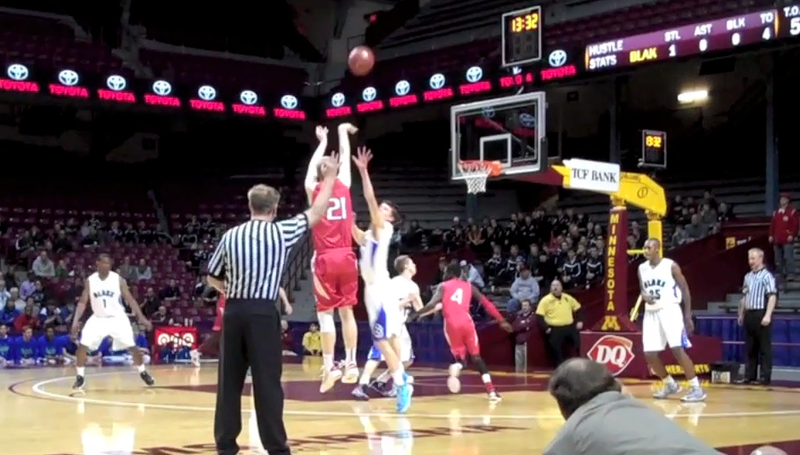 The Austin Packers trailed by 7 at halftime, and the deficit was as large as 11, but they stormed back in the second half for a 59-56 win over The Blake School Wednesday in the Minnesota Class AAA quarterfinals at Williams Arena. Joe Aase led the Packers with 20 points, including four second-half threes, while Ajuda Nywesh tallied 15 and had numerous timely steals. Zach Wessels chipped in 9, Tom Aase 8, Collin Weisert 5 and Bret Lukes 2. See the stories in the Austin Daily Herald, Rochester Post-Bulletin and Minneapolis Star Tribune, as well as the KAAL-TV coverage. The Packers now face #3 Marshall at 2 p.m. Thursday at Target Center. As you can see in the video above, the community support for the team Wednesday was amazing. Let’s make sure we’re just as strong for the semifinals. If you can’t attend in person, you can follow on KAUS radio, or watch on KAAL Digital Channel 6.2. If you’re not in the Austin area, you also have the option to stream the game live on Prep45.com.